Perry B. Cotham at 97 years of age teaches 9 lessons from his new book Beyond the Sunset. Topics include: Is There a God? Where Are the Dead? Will Jesus Come Again? Will Any Infants Be Lost? What About the Millennium? What About the Jews? Will Hell Be Eternal Punishment? What Is Heaven Like? What About Further Recognition? This series of lessons is great for church Bible class or for home personal Bible study. It has been the questions of the ages: “Is there anything beyond this earthly life or does death end it all and we just cease to exist?” and “Is there a God?” In this lesson, Perry B. Cotham takes an in-depth look at the Scriptures to answer these two critical and timeless questions. What happens to a person’s spirit when they die? What does the Bible say on the matter? In this lesson, Perry B. Cotham delves into God’s Word to give an answer to these questions. The New Testament provides Christians with the hope of Jesus return. However, many people have misconstrued the Scriptures and have presented false ideas about this glorious event. Join Perry B. Cotham as he presents an in-depth Biblical lesson about this important Biblical topic. Many people have asked the question, “If an infant dies without being baptized, is that infant going to be lost in eternity?” Join Perry B. Cotham as he delves into the word of God to accurately answer this question. A common doctrine that is being taught is that when Jesus comes again to Earth, He will reign for a literal 1,000 years. Do the Scriptures teach this? What does the Bible say about Christ’s return? Join Perry B. Cotham as he rightly divides the word of God and imparts godly wisdom on this subject. Does the Bible teach that one day, before the end of time, that all Jewish people will be converted to Christ? Will the join Him in eternity? In this lesson, Perry B. Cotham takes an in-depth look at the Scriptures to answer these questions. The Bible speaks of heaven and of hell. 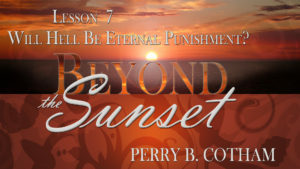 Many people ask the question, “Will hell be eternal punishment?” Join Perry B. Cotham as he gives an in-depth Biblically sound lesson concerning the place referred to in the Scriptures as hell. Speaking of heaven, Jesus said, “And if I go and prepare a place for you, I come again, and will receive you unto myself; that where I am, there you may be also.” Christians can find great comfort in these words, knowing that they have a peaceful eternal resting place. In this lesson, Perry B. Cotham imparts to us the rich and glorious picture of heaven that is described in the word of God. Will we know each other in heaven? Will we recognize our loved ones and friends after death? Join Perry B. Cotham in this lesson as he explores the Scriptures and gives scripturally based answers.